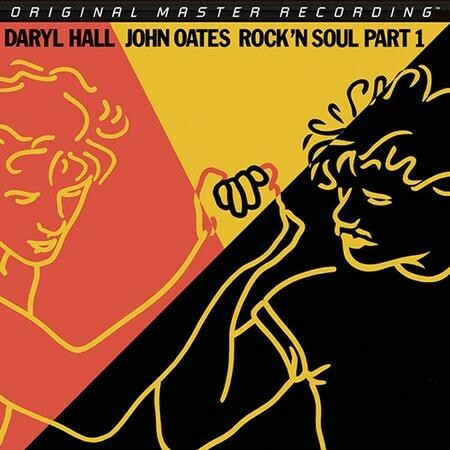 The Definitive Hall and Oates Greatest-Hits Compilation: Rock 'n Soul Part I Loaded With Nine Top 10 Singles, Including "Kiss On My List" and "Private Eyes"
Blue-Eyed Soul and New-Wave Pop Duo Dominated the Charts: All the Signature Songs From the 1970s and '80s Are Here, From "Sara Smile" and "She's Gone" to "Maneater"
Other compilations have longer track lists and go farther back into their career, but no Hall and Oates greatest-hits collection surpasses Rock 'n Soul Part I. Originally released at the height of the duo's career in the fall of 1983, the 12-song set functions as a time machine back into an era when Daryl Hall and John Oates dominated the charts with songs that have long since become standards. While a majority of the anthology draws from the group's trio of mammoth RCA albums spanning 1980 through 1982, it also includes the pair's only three Top 10 smashes from the 1970s: "Sara Smile," "She's Gone," and the chart-topping "Rich Girl." One-stop shopping for the absolute best of Hall & Oates doesn't come any easier. Mastered from the original master tapes, Mobile Fidelity's hybrid SACD reissue presents nine Top 10 Hall and Oates singles with awe-inspiring detail and palpable realism. Lifelike tones grace the array of guitars, pianos, basses, and voices placed against synthesized backdrops. Each member's singing claims enhanced intimacy and balance. The collective harmonies sound sharper, the dynamics richer, and the soundstages wider and deeper. While the tandem's peers often relied on robotic mechanisms and now-dated keyboard devices, Hall and Oates wisely merge the period's savvy styles with tried-and-true soulful instrumentation. Indeed, with one listen to this definitive-sounding SACD version of Rock ‘n Soul Part I, and you'll understand why the duo's music not only ruled radio and record stores in the Reagan era but also continues to be referenced by influential artists today. You already likely know every song – or nearly every one of them – here by heart. Arriving upon a near-flawless fusion of dance grooves, soft rock rhythms, smooth vocals, romantic sentiments, catchy beats, and spotless hooks with #1 singles such as "Kiss On My List" and "Private Eyes," the collaborators simultaneously crossed over into multiple markets and eradicated boundaries. All the trademarks – swinging verse structures, call-and-response choruses, stick-in-your-head bridges, sleek keyboard layers, doo-wop fills, and, in some places, reggae-nodding accents or cool saxophone lines to stir up the mood and atmosphere – that make the duo's music irresistible pulse throughout Rock ‘n Soul Part I. Eight of the singles included here cracked the Top 5. They remain prototype intersections of blue-eyed soul, edge new wave, and dance, blueprints for pop mastery that catapulted Hall and Oates to becoming the most successful duo in rock history.